Eagle Bay's spring seasonal "Brewer's Choice" release is the Steam Ale. And, unlike what's probably the best known Steam Ale in the country – Mountain Goat's, which is more a pale, hoppy golden ale – it's a steam ale in nature rather than name. The term originates from the West Coast of the US, from a time in which brewers were producing beers without proper refrigeration, meaning they ended up fermenting beers containing lager yeasts – which prefer colder temperatures than ale yeasts to do their work – rather warmer than they might have liked. The result was for the yeast to emit more fruity esters than you'd find in "cleaner", cold fermented lagers. 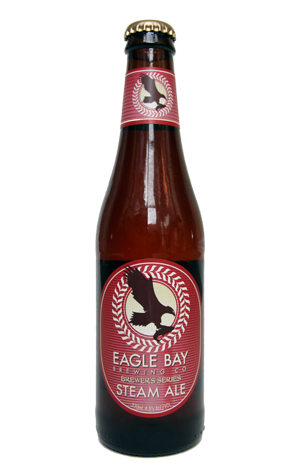 Eagle Bay's take on the style recreates that situation – for fun rather than out of necessity – and the result is a deep copper coloured brew that mixes those fruity esters with creamy toffee and nutty malt flavours and aromas to create a relatively full bodied lager / ale hybrid.